12 | TH E M R EP O RT EXPOSURE 2. 3. 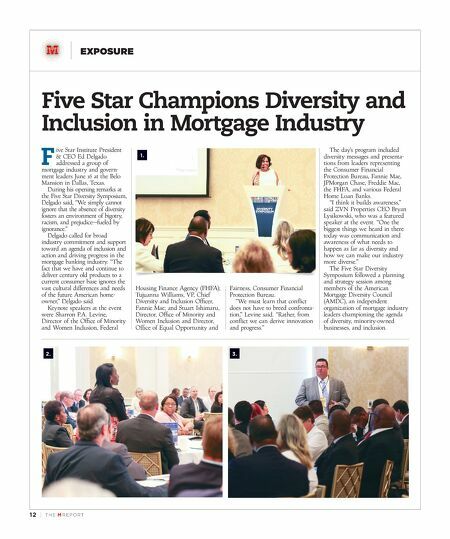 Five Star Champions Diversity and Inclusion in Mortgage Industry F ive Star Institute President & CEO Ed Delgado addressed a group of mortgage industry and govern - ment leaders June 16 at the Belo Mansion in Dallas, Texas. During his opening remarks at the Five Star Diversity Symposium, Delgado said, "We simply cannot ignore that the absence of diversity fosters an environment of bigotry, racism, and prejudice—fueled by ignorance." Delgado called for broad industry commitment and support toward an agenda of inclusion and action and driving progress in the mortgage banking industry. "The fact that we have and continue to deliver century old products to a current consumer base ignores the vast cultural differences and needs of the future American home - owner," Delgado said. Keynote speakers at the event were Sharron P.A. Levine, Director of the Office of Minority and Women Inclusion, Federal Housing Finance Agency (FHFA); Tujuanna Williams, VP, Chief Diversity and Inclusion Officer, Fannie Mae; and Stuart Ishimaru, Director, Office of Minority and Women Inclusion and Director, Office of Equal Opportunity and Fairness, Consumer Financial Protection Bureau. "We must learn that conflict does not have to breed confronta - tion," Levine said. "Rather, from conflict we can derive innovation and progress." 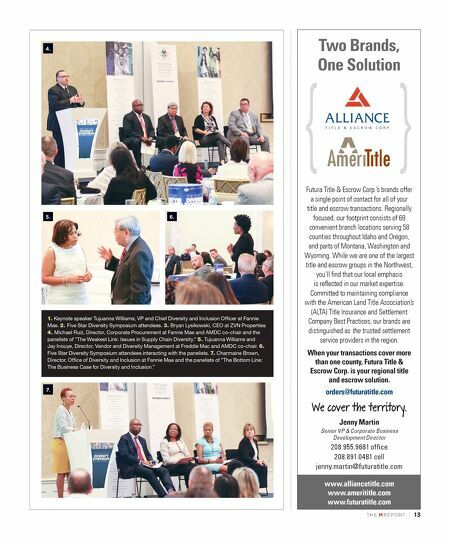 The day's program included diversity messages and presenta- tions from leaders representing the Consumer Financial Protection Bureau, Fannie Mae, JPMorgan Chase, Freddie Mac, the FHFA, and various Federal Home Loan Banks. "I think it builds awareness," said ZVN Properties CEO Bryan Lysikowski, who was a featured speaker at the event. "One the biggest things we heard in there today was communication and awareness of what needs to happen as far as diversity and how we can make our industry more diverse." The Five Star Diversity Symposium followed a planning and strategy session among members of the American Mortgage Diversity Council (AMDC), an independent organization of mortgage industry leaders championing the agenda of diversity, minority-owned businesses, and inclusion. 1.